Good afternoon, space fans! Here's what was up this week aboard our favorite orbital outpost! Subtropical storm Ana, off the east coast of the U.S., spins up some stunning imagery. NASA astronauts Scott Kelly and Terry Virts spent time replacing components in the ISS's Carbon Dioxide Removal Assemblies (CDRA), which keep the atmosphere in the space station well-regulated for human breathing. Kelly also collected data from several acoustic dosimeters, which measure noise in the station. All in all, the ISS atmosphere stayed clean of too much carbon dioxide and too much noise. The station crew also spent time photographing the phases of the moon, part of a project that is lasting for a 29-day cycle. This moon-map will aid in the calibration of a navigational device intended for NASA's upcoming Orion spacecraft, which will transport the first humans to Mars. It will also allow navigators of future spacecraft to use the moon and the stars to orient themselves, should other navigational equipment suffer problems. A time-honored tradition that has been in place since the days of ancient mariners, now the same techniques can be applied to the future in space! A crescent moon, as seen from the ISS. Remember that crazy mishap with the Progress 59 cargo craft missing its mark? Well, it wasn't hijacked by aliens for its delicious space-food cargo. Roscosmos reported that it reentered the atmosphere on Thursday, at 10:04 PM EDT over the central Pacific Ocean. Neither the ISS crew nor anyone on Earth was placed in danger due to the mishap, and NASA reports that the crew are well-supplied even beyond the arrival of the next cargo shipment. And that's all she flew. The Progress 59 disintegrates above the Pacific Ocean. Three of the crew, including commander Terry Virts, ESA astronaut Samantha Cristoforetti and cosmonaut Anton Shkaplerov will be returning to Earth next week, and conducted safety tests on their Sokol space suits in preparation for their descent. Virts also helped out his Russian comrades with fresh haircuts. keeping it fly in micro-G. Speaking of travelling to and from the Earth, a SpaceX crew capsule launch test proved successful on Wednesday, after launching from Cape Canaveral and conducting a mile-high liftoff test. 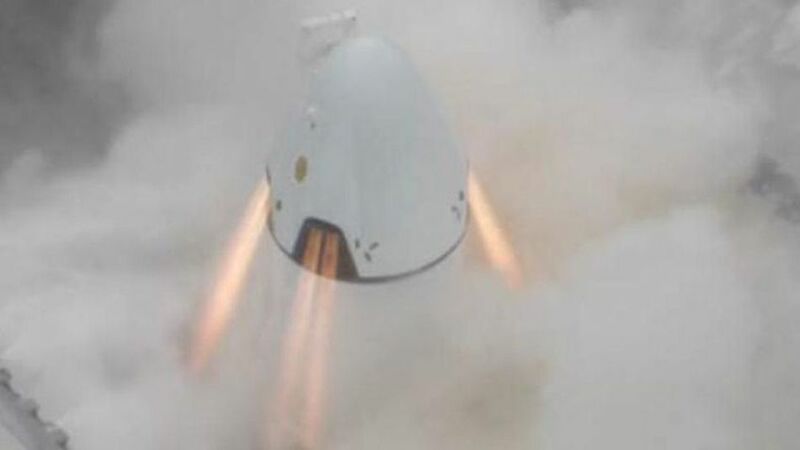 According to Spaceflight Today, the capsule was fueled by eight SuperDraco rocket thrusters that provided 120,000 pounds of thrust, propelling the craft to 100 miles per hour in only 1.2 seconds. A top speed of 345 m.p.h. was achieved. A human-sized test dummy rode aboard, which tests indicate would have been just fine had it been a live person. Aww, what a cute little spaceship! 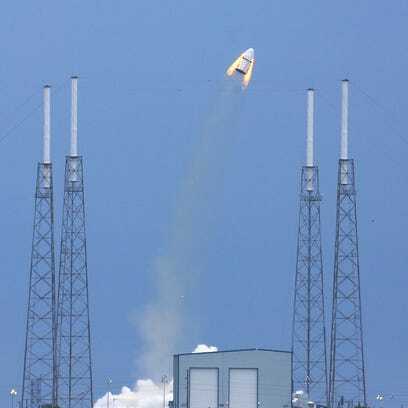 The SpaceX crew capsule launches from Cape Canaveral. SpaceX declared the flight a success, and Musk said it "bodes well" for future launches. The company plans to launch manned crew capsules to the ISS in 2017. The unmanned crew capsule in action. Congratulations, SpaceX! That's all for this week, space fans! Check us out next week to find out how three spacefarers make their way back down dirt-side. Watch this space! like this windblown sand-scape on Earth.